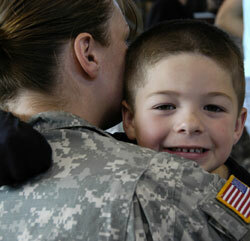 Approximately two million military children have experienced a parental deployment since 2001. Nearly 80 percent of military children attend public schools throughout the United States. The repeated and extended separations and increased hazards of deployment compound stressors in military children's lives. The U.S. military consists of approximately 1.4 million active duty service members and 810,000 National Guard and Selected Reserve. Active duty military families live on or near military installations worldwide. National Guard and Reserve families might never live near a military installation, and look within their community for educational services, friendship and support. Supporting the military child takes a school-wide effort, and professional development opportunities to inform school staff of the academic and social-emotional challenges military children face. Flake, E.M.; Davis, B.E. ; Johnson, P.L. ; Middleton, L.S. (August 2009). "The Psychosocial Effects of Deployment on Military Children." Journal of Developmental & Behavioral Pediatrics. 30, 4:271-278.